Today’s industry competition is no longer about delivering results to customers alone, now that user experience is at the heart of every application design. And if you take control of the performance of your applications, optimal user experience must be your main goal. Using only a top-grade monitoring solution can this goal be ever achieved. Good to know, you have a wide option of APM (Application Performance Management) in the market. But with numerous vendors out there, choosing the best one can be a challenge. To help you choose what’s best for you, here are the critical features you want to look for an APM vendor. As an important part of NOC support, Application Performance Management (APM) simply refers to monitoring and management of the availability and user-experience of a software application be it a stand-alone app or cloud-based app. It is composed of tools that monitors, measures and diagnoses the end-to-end status of an application. The role of APM, however, does not end in providing relevant metrics data. Its major role is to provide sensible and actionable insights from these metrics. APM’s key role is to provide you data-backed answers to your “why” questions (e.g. why does the app response slowed down, why it crashed). Aside from policing the performance of a software app–making sure that it is working at its best capacity–APM also serves to give actionable data to continuously improve the end-user experience. 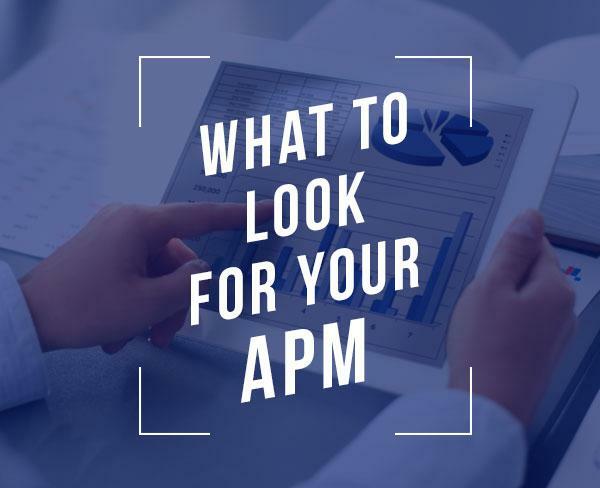 Therefore APM is at the core of maintaining an application, preventing issues, and troubleshooting problems in order to deliver optimal user experience. That being said, it’s no surprise that APM is crucial for organizations that run software apps. Now, if you’re looking for an APM vendor here are some of the features and services must look for. You can only identify current and potential performance bottlenecks if your APM digs deep seated data that would provide you a holistic view of your application delivery process. Deep meaningful analytics are the very foundation of identifying the root cause of a performance anomaly. Put your concern across all levels of environment from network to server level, and code level to end-user device. A good APM enables you to define your benchmarks on how you want users to experience your app and control each step of the delivery process. Thereby you can see the choke points and understand the behavior of your apps. For most companies that include legacy technologies in their IT environment along with the cloud, the ability to monitor software apps on both technologies is non-negotiably important. This is because adding new technologies may pose problems. And if not, adding a patchwork of monitoring tools can be inefficient. The best option is to monitor from a single platform. To achieve this, look for APM vendors that offer plugins and integration which can combine metrics data from the cloud and your legacy infrastructure. Data from all sources must be treated in the same manner so you can generate analytics that accounts for all data across ecosystem. Detecting abnormal behavior of your application from a complaining customer should be the last resort. As an organization, you should race to detect outages before a customer complain about it. As such, you need a working real-time alerting system. A top notch APM solution allows you to set triggers e.g notifications, when metrics reached certain thresholds. These notification alerts should then automatically reach the right people and application. This could be an email to the Ops team and/or a command to a server. Since end user experience is your main goal as an app provider, you’d want to have greater visibility on how your app is responding to real users. As such, you want an APM with Real User Monitoring to let you see the performance of your applications while utilized by users across different devices and locations.